Watching videos on Netflix will provide you access to an amazing library of content ranging from TV shows to movies, documentaries, and so on. However, while it can be convenient to stream that content on demand on most of your devices like Computer, Laptop, Smartphone, or Tablet – but if you want to download any videos to watch them offline or on any other devices you’re likely to run into problems. Although Netflix does have a feature that will let you ‘Save’ videos to watch later, it is really quite limited and only works on selected titles anyway. So if you would like a more versatile and universal way to go about it, you need, look no further than Movavi Screen Recorder. If you want to use Movavi Screen Recorder to download Netflix videos, you need to set it up to record them as they’re playing on your screen. Assuming you’ve already installed the recorder, you can start by loading the Netflix video you want to record but pausing it so that it doesn’t start to play yet. When you launch Movavi Screen Recorder, the first thing you should do is set it to record the area where the Netflix video is located. 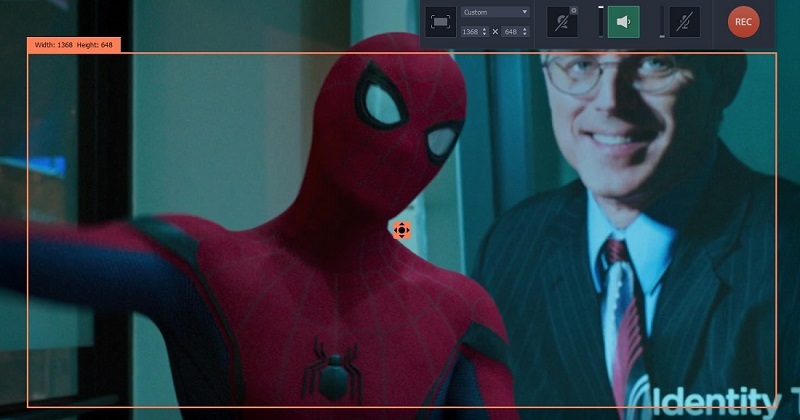 If it is playing in a window you can immediately draw a frame over it using your mouse cursor, or if you’d prefer to record it in ‘full screen’ you can click anywhere then open up the list under ‘Capture Area’ and select your monitor in the ‘Full Screen’ section. Naturally, you would also want to record the audio from the Netflix video, which is why you should check that the ‘System Audio’ icon on the interface is highlighted, or click to toggle it. At the same time, you should also check that the ‘Microphone’ icon isn’t highlighted, and toggle it off if it is so that Movavi Screen Recorder doesn’t record audio from it. It is possible to set Movavi Screen Recorder to automatically stop recording when your Netflix video is done by enabling its ‘timer’ feature. Click on the ‘alarm clock’ icon, and you should be able to enable the timer and set the duration of the video you’re recording. Assuming you’re satisfied with how everything is set up, click ‘REC’ and play the Netflix video within 3 seconds of doing so. If you didn’t automate the recording, you can then control it using the icons on Movavi Screen Recorder’s interface and stop it when it is done. That is really all that is required, and after you stop recording Movavi Screen Recorder will automatically save your video in MKV format. It will also open it up in a preview window, and you can trim out unwanted footage or save it in a different format at this point too. All of this is likely to just take a few minutes, excluding of course the duration that it takes to record the video. The best part is that via this method you can use Movavi Screen Recorder software to ‘download’ any Netflix videos – sans the usual limitations.